Within the continental United States for orders over $100.00. 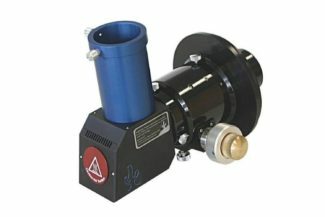 152 mm f/6 dedicated h-alpha telescope for professional results! Dual Internal etalon allows a <0.5 Angstrom bandpass. True Doppler pressure tuning system for precision tuning adjustments. All Lunt Solar Telescopes require a blocking filter. Which blocking filter is right for you? The Lunt LS152THa is currently the largest solar telescope available, and is sure to provide the most stunning balance of resolution and performance. The 100% unobstructed system will perform to the highest level at both low and high magnifications. Utilizing both advanced high-contrast coatings, and the new Doppler True Pressure Tuning system, the user will be able to experience crisp, sharp, high magnification visual images, as well as utilize this system for high end digital processes. True Doppler Tuning allows for a shift into and away from the user. Adding a 3D like component to the viewing experience. While it has minimal effect on proms due to their location at the edge of the disk, it does have an effect on filaments and active regions on the surface. While looking at a filament at the center of the Sun, the user has the ability to Doppler shift from the base of the filament to the tip, following the filament through it’s structure toward you and away from you, allowing for enhanced visual and imaging capability for the observer as well as a research tool for the avid hobbyist. The pressure tuning system provides an order of magnitude more precision to the tuning of the desired features. This system has an optional, interchangeable, CaK module allowing for the research of multiple wave lengths thru the same platform. You can also convert the LS152THa for nighttime viewing with a special backing plate & focuser kit. The Lunt Solar Systems LS152THa Solar Telescope is perfect for the Intermediate to Advanced User. Advanced Narrow Band Hydrogen-alpha dedicated system. A refractor-based system with a 152 mm front objective. An unobstructed internal HD Etalon with the Pressure Tuner allows for <0.5 Angstrom bandpass, providing slightly higher surface detail without the loss of edge detail. The system includes the mounting rings and dovetail, a Lunt Zoom Eyepiece, dust caps, and is delivered in an aluminum reinforced case. Latest news about the sun from NASA. DMK cameras have become the imager of choice for Solar imaging. The Monochrome version is an excellent choice for both Solar and Nighttime applications. Lunt now offer both the standard Windows and Lunt branded MAC software. MAC software is available by clicking here . The Imaging Source DMK 21AU04 monochrome camera has a USB 2.0 interface and is the perfect solution for many industrial automation, quality assurance, security, surveillance and medical applications. The monochrome camera ships with the very sensitive / ” Sony CCD ICX098BL sensor. With up to 60 images per second, the DMK 21AU04 is a low cost, yet highly versatile imaging solution. The camera includes a C to CS mount adapter, making it compatible to C and CS mount lenses. Using the optional CS to M12 board lens adapter, the camera is also compatible to M12 board lenses. Back plate & standard Crayford Focuser for the LS152THa allows you to convert this dedicated solar telescope into one that can be used at night! CaK diagonal shown in this image is not included. Add an internal double-stacking module to a Lunt LS152THa solar telescope for a lowered bandpass of <0.5 Angstroms! The LS152THa DSII includes a pressure tuner for true Doppler tuning. Add it yourself to your own LS152THa, no trip back to the factory required! Please Note: If this product shows “Available on Backorder” and you would like to “get in line” by placing an order with a 10% deposit, send us an email. A member of our staff will contact you with lead times and deposit information. 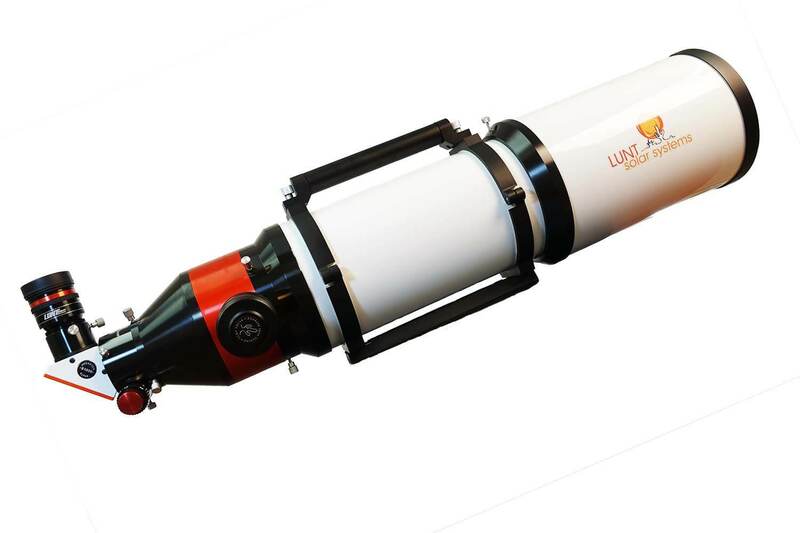 The Lunt Solar Telescope LS50THa is a 50 mm h-alpha f/7 dedicated telescope. An internal etalon with pressure-tuning adjustment allows for a <0.50 Angstrom bandpass. The LS50THa comes with an integrated clamshell mounting. It’s the perfect telescope for visual & imaging use. A blocking filter is required with this system. Internal etalon allows a <0.65 Angstrom bandpass. The LS152THa includes a 2″ Starlight Instruments Feather Touch Focuser, Lunt Zoom eyepiece, aluminum case, mounting rings & dovetail and your choice of blocking filter. A 60mm f/8.3 dedicated solar telescope with additional 50mm aperture secondary removable filter. Dual etalons with tilt-tuning allows for <0.55 Angstrom bandpass. 60 mm f/8.3 dedicated h-alpha telescope. An internal etalon with tilt-tuned adjustment allows for a <0.8 Angstrom bandpass.